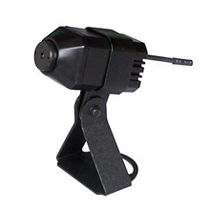 This Mini 2.4GHz wireless camera has a built in microphone so it can transmit video and audio to a wireless receiver, its size makes it an ideal choice for hobbyists wishing to mount cameras into remote control vehicles or someone wanting a discrete camera for video surveillance use. The camera can be powered from a 9v battery via the battery clip (included), a PP3 (also included) will power the camera for approx. 2 hours. This camera is available in one of four channels. Channel number is subject to current availability.